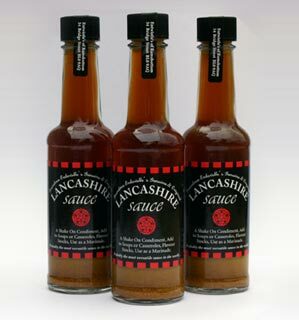 Lancashire Sauce is an oil free, mildly spiced liquid seasoning, which is suitable for Vegetarians and Vegans. It greatly enhances the flavour of your food. Use it in the same way you would salt, pepper, or vinegar i.e. Before cooking as a marinade, during the cooking process or on the finished product...or indeed all three! settle on standing. A vigorous shake before use wakens the spices and creates the unique flavour and aroma. The sauce represents the county's strong identity for tasty, traditional food and successfully compliments this type of fayre. In addition to this, the blend of spices we use appeal to a much wider taste and cuisine making it probably the most versatile sauce in the world!